Joining us is Shayba Muhammad, Designer and Owner of Mahnal Jewelry. Mahnal is a collection of handcrafted contemporary brass jewelry. Taking inspiration from nature, architecture and texture, Mahnal seeks to shed light on diversity, Islam and the Arabic language. Shayba began studying design and fashion while at the Institute of Art in Chicago. She relocated back to St. Louis to study metalsmithing and jewelry full time. Shayba focuses her efforts on growing Mahnal and adding to the local ... See More small business economy. - Shayba takes us along her design journey...it began with a love for art at an early age. - How she came to metalsmithing as her discipline of choice. Why did she choose Brass? - Shayba's creative philosophy and how this connected to her broader vision. - Shayba incorporates a personal message to women and a message of diversity with her work. What does she want to communicate to the community and to others? - More about the Makers Mart. 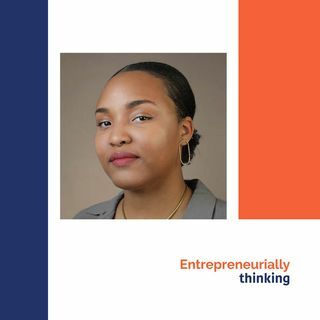 - Details about entrepreneurial work she is building for underserved communities. - What is her greatest accomplishment and creation? - Lessons for other artists and entrepreneurs from her experience.